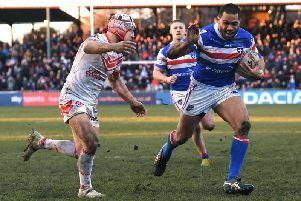 Wakefield Trinity star Pauli Pauli will miss the start of the new Super League season after suffering a knee injury. The giant 24-year-old forward, who made a big impact at Trinity in his debut Super League campaign last year, is facing between two and three months on the sidelines after sustaining the injury in the pre-season clash at Newcastle Thunder last weekend. Pauli damaged his posterior cruciate ligament during the first half of Saturday’s 16-6 defeat in the northeast. Scans on Monday revealed the extent of the damage and following consultations with an orthopaedic knee specialist, the Trinity star is facing several weeks away from the action. A statement released by Trinity said: “He has been placed in a knee brace for the first three to four weeks. The former Newcastle Knights and Parramatta Eels player scored eight tries in his 27 appearances for Wakefield last term.